To explore the National Reserve of Eduardo Avaroa, we opted for a jeep tour with Estrella del Sur in San Pedro, which we can highly recommend. 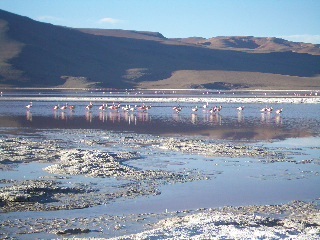 This huge park in south west Bolivia is a spectacular bombardment of the senses with lagoons in red, green, white and blue, bubbling mud pools, puffing geysers, steaming hot pools, remarkable rock formations, shy vicuñas, proud llamas, pink flamingoes, and very sandy tracks reaching altitudes of 5,000m. 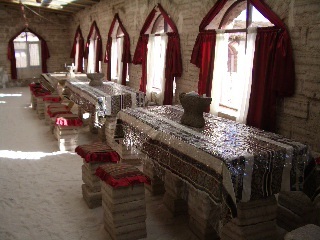 On the second night we stayed in the Salt Hotelin Atullcha. 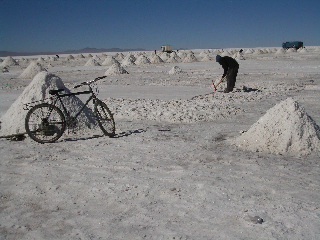 This friendly place is built entirely of salt blocks; we sat on salt, walked on salt, slept on salt and ate off salt… so anyone complaining of bland soup there, has only himself to blame! 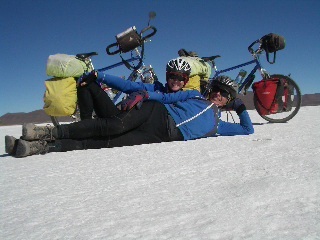 Back on the bikes, an hour-long sludge through a sandy, salty poppadom or fasnachtschuechli-like surface… and we were on the famous Salar de Uyuni. This 12,000km2 (and growing) salt lake is the world’s largest, and visible from the moon. In this season (winter) it’s totally dry, and therefore the widest and whitest bicycle path on earth! 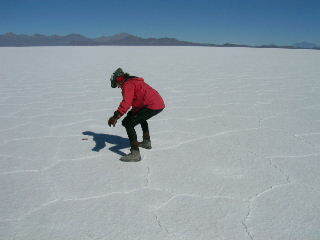 Its sparkling, dazzling and endless expanse looks like ice, feels like ice… but tastes exactly like salt. 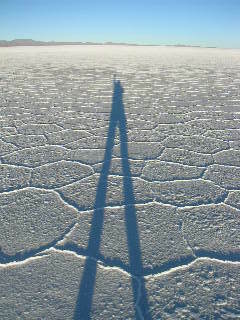 Tiny cracks in the salt produce a tiled appearance on the surface…. Ideal for playing hop-scotch! 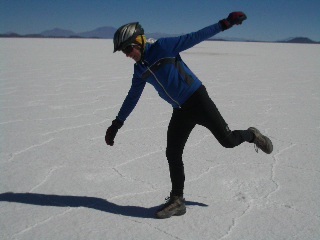 Playing hop-scotch on the Salar de Uyuni! We spent out first night on the gorgeous cactus Incahuasi Island, where we felt like 5-star guests in their cosy refugio (hut) overlooking the salar. Kurt is still bamboozled by this remote restaurant’s culinary capabilities. On ordering llama filet, the waiter enquired ifRoquefort sauce would be appreciated. Not only could he pronounce Roquefort, but he even delivered! 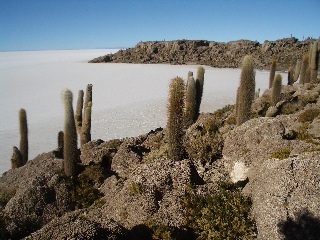 Another 60km later, we set up camp on this stunning white desert landscape. We made sure to be in our thermals, winter woollies and sleeping bags by sundown, when the temperature drops like a lead balloon. Minus 24 degrees Celsius is a tad on the fresh side, even for Eskimos like Darina! Waking up on July 1 in these unique surroundings was perfect for celebrating one year on the road. 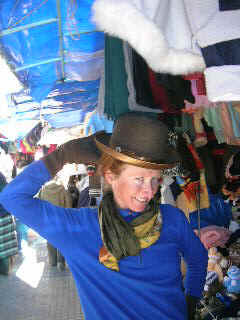 First impressions of Bolivia are very positive. People seem to be very calm, laid back, friendly and helpful. 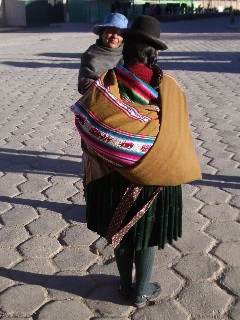 Their indigenous faces radiate peace and warmth. 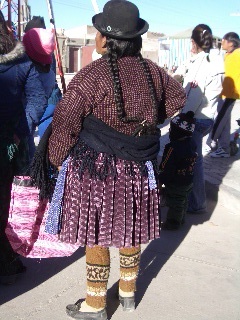 The most amusing sight so far is the ladies’ traditional attire. Sporting thick wool pleated skirts, knitted cardigans, knee high socks/leg warmers, skimpy sandals, long girlie plaits, and colourful baby bundles tied to their backs… all topped off with a bowler hat – these women are making a serious fashion statement! 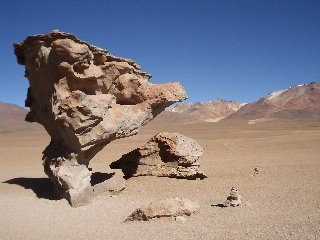 For the next while we will be exploring the altiplano of Bolivia with altitudes remaining generally above 3,000m. We are happy to report that our breathlessness is now under reasonable control (with the help of coca tea) and we’re game for new adventures. 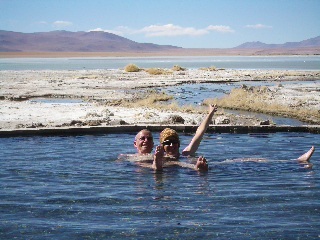 Uyuni’s tourist information was extremely informative and gave us very good advice on how best to leave this bitterly cold town i.e. on the bus! 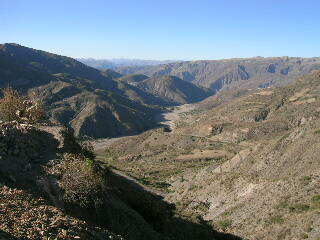 The journey to Potosí, a mere 210km, took no less than six hours non-stop. This gives some indication of the deteriorated state of this corrugated, sand track topping 4,300m for fun, on numerous occasions. Not something we were eager to inflict upon ourselves. 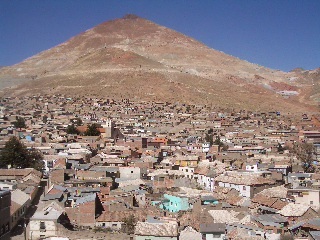 Potosí, the highest city in the world, is perched at 4,000m above sea level. This was yet another test for the lungs. Even just walking down the street was hard and it took us a couple of days to acclimatise. 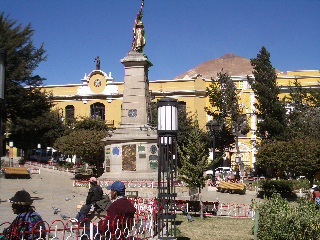 A colonial town of 150,000 today, Potosí was, in the 17th century, second only in size and prosperity to London. On discovering deposits of silver in the mountain towering above, the Spanish set up camp in 1545 and started their exploitation of silver, native indians and African slaves to earn their fortunes. Cerro Rico (Rich Mountain) was quite the mine and even 500 years later, there are still 12,000 working there daily, in the knowledge that there is still another 10 years of tin, lead, silver and gold to be dug out. The frightening reality is that the miners’ working conditions haven’t improved at all in the interim period. 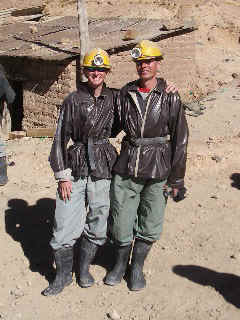 We took a tour down the mine and spent three hours underground in the complete darkness, at temperatures of up to 40 degrees Celsius, coughing and choaking in the dust, at reduced oxygen levels. 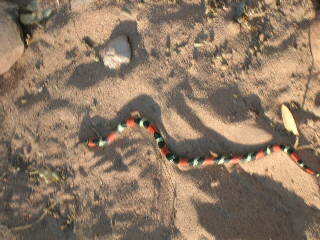 At times we had to slither like snakes in very confined tunnels to drop another level. There we would find miners from the age of twelve, in totally inhumane conditions, hacking holes in the wall and hammering at rocks to grade their mineral content. A typical working day is eight hours with no lunch break. 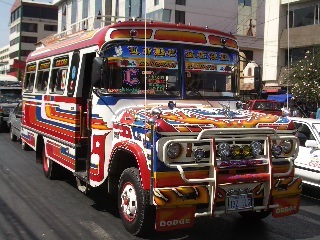 We brought presents of CocaCola, coca leaves… and dinamite! 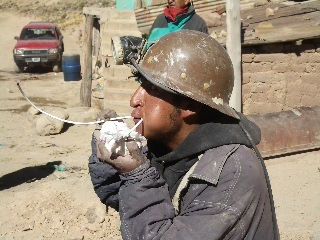 The miners chew coca leaves to suppress appetite and sustain their bodies at this high altitude. After four hours in the mouth, coca leaves go bland and so when the second mouth full becomes tasteless, the miners know their day’s work is done. The local answer to a modern Rolex! 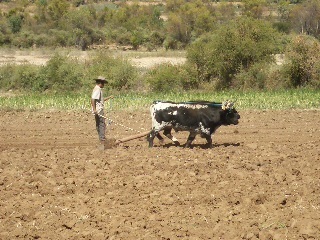 They work 6 days a week, for no more than 3 euros a day. 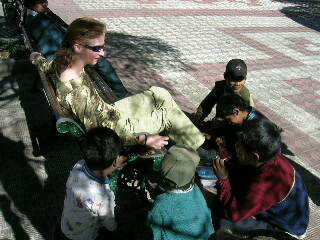 Some of the men we spoke to had a wife and 6 kids to feed back home. Their life expectancy is around 50 and most are quickly scarred with silicosis and TB. 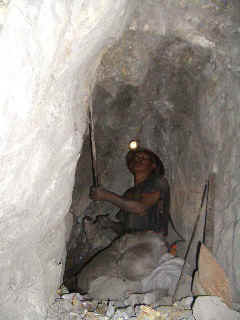 90% of the miners endure such conditions merely because there are no alternatives in the area. What will become of these 12,000 miners and their families in 10 years time, when all the minerals are depleted? It was definitely not the most pleasant tour we have done, but certainly the most impressive. Koala tour guides are all ex-miners and give great insight into the real story of Cerro Rico. 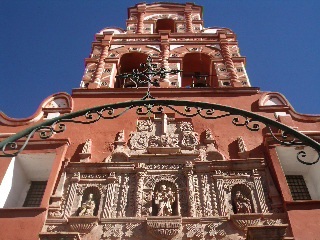 The Casa de la Moneda (the mint) in Potosí is an attraction well worth visiting. 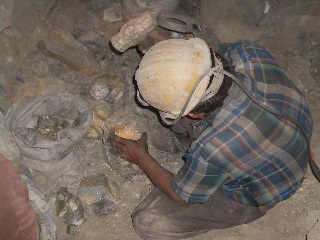 Here the silver from the mines was cast into coins for the whole Spanish Empire. On display are numerous original hammered coins that managed to avoid the thievish hands of Sir Francis Drake. 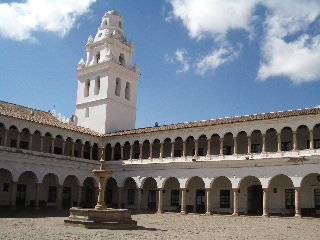 A lot of the riches from Cerro Rico were amassed by the clergy and transformed into elaborate churches and colonial buildings, making Potosí a delightful tourist destination. 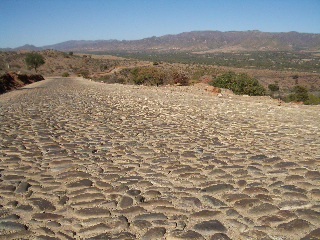 The road to Sucre was a welcome change: tarmac. 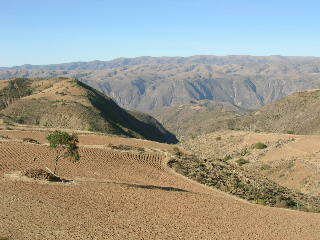 The 2-day journey included a phenomenal downhill, followed by almost as phenomenal uphills all the way to Sucre. After 100km we decided to stop at Millares for the night. Alas, the pensiones (guest houses) were no longer offering accommodation, so everyone sent us down to the local hospital. It seemed a strange suggestion, but was chorused by all en route, much to the dismay of the doctor in residence. It obviously wasn’t the first time… but he still didn’t have any beds to offer! Carlos and Marta, his friendly neighbours, came to the rescue and opened up their newly-built holiday home for us, while they returned to Potosi. One week later the favour was extended to Liam and Claire and again to Tim and Alain, making their house quite the Casa de Ciclistas. 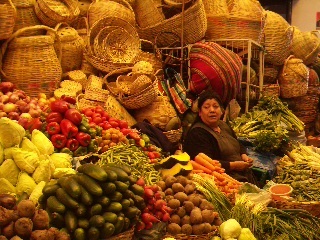 Many thanks for such wonderful Bolivian hospitality! Soft rolling hills with very deep cut valleys, where the river bed took up all the available space below, provided the scenery on this stretch. Trees were sporting autumn hues and the rocks varied from rusts to greys. 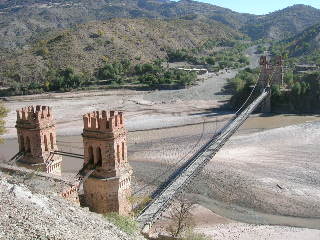 We had a double take when we came across a magnificent medieval-style suspension bridge in the middle of nowhere. 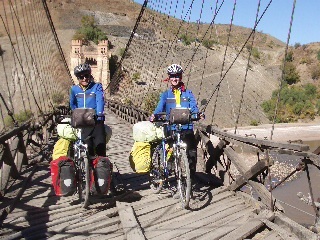 Branches and planks strapped together formed our bumpy, but exciting, alternative crossing. 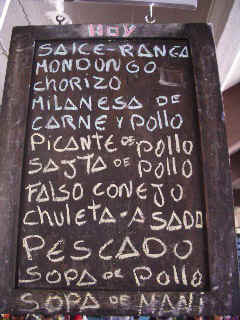 Sucre, a pretty colonial town of white-washed houses and red-tiled roofs is quite reminiscent of Andalucia, Spain. It is considered to be the birthploace of the Republic of Bolivia because the Declaration of Independence was signed there. 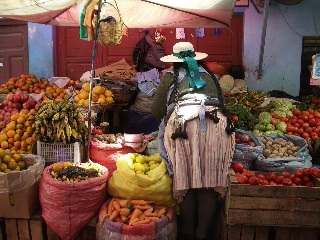 Today it is Bolivia’s constitutional capital. After 300 years of colonisation, the Spaniards were finally driven out of Bolivia in 1825. 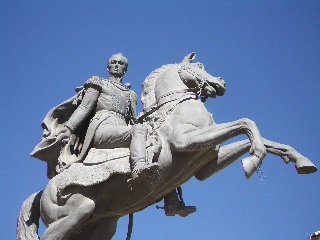 This departure was brought about by 2 famous Venezuelan liberators, who presently give their names to the country, a city and numerous streets: Bolivar and Sucre. 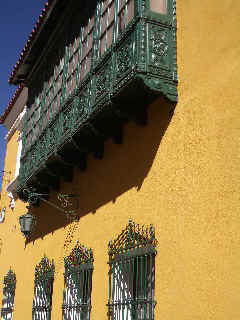 The Casa de la Libertad in Sucre recounts their numerous exploits on the road to liberation. 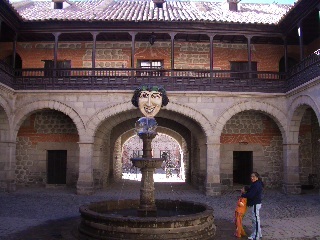 It was a great place to while away the time, visiting churches; not forgetting our daily expedition to the market. It took us a whole week to eat our way through the varied menu of soups and main courses. Amazingly, we could eat our fill for about 0.75 euros. 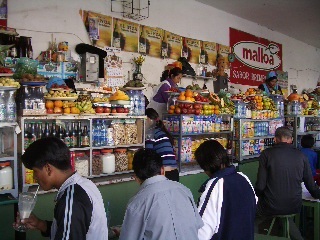 Then we had to visit our fruit/juice dealers for delicious freshly-made exotic fruit salads with yoghurt, and frothy milk shakes. 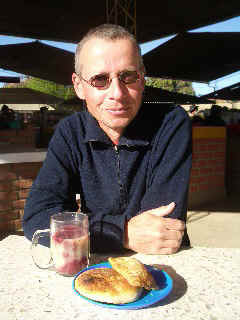 Breakfast at the market is usually Api (a hot, quinua cereal drink) with fried bread, which comes to the grand total of 10 cents per person! Soups are a meal in themselves with meat, veg and rice in a well, flavoured stock. 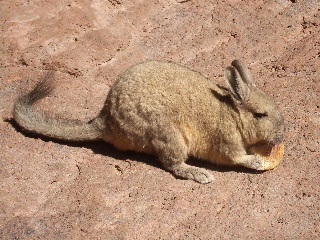 Our variety of meat has also extended to the exotic with llama and vizcacha (rabbit-like animal) stews. 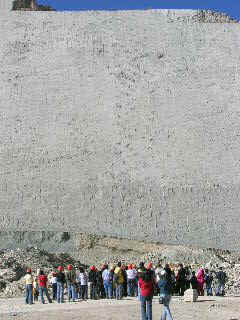 In 1994, in the local cement factory, some strange tracks were discovered on a wall. 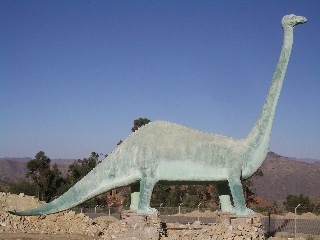 Further investigation revealed that this was a pre-historic soccer field where Titanosaurius Utd. played Tiranosaurus FC in the cup final. Argentine and Brazilian archaelogists still dispute the final result of this deciding game! 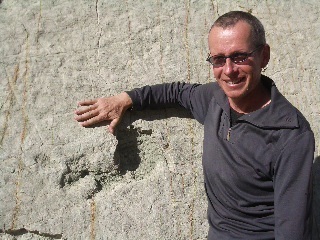 With the collision of two tectonic plates, these dinosaur tracks, from 65 million years ago, were pushed into a vertical position, and later exposed by explosions at the cement factory. Reaching up to 25m in size, these herbivores and carnivores were quite the monsters, and probably more suited to basketball! The Indigenous Art museum has a fantastic display of unique textiles depicting everything from domestic and agricultural scenes to your worst, scary nightmares. 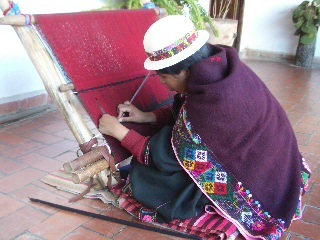 Woven without patterns, it is fascinating to watch how the weavers create such intricate, non-symetrical designs out of their heads, even without the help of LSD! 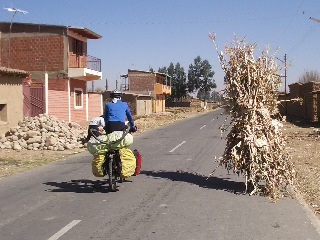 The road to Cochabamba had all the features of shake, rattle and roll. A relay of able-bodied boys and men cheerfully pushed us both up the final hill of Sucre which made for a very animated departure. 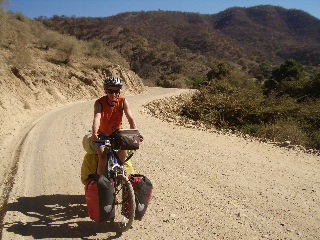 From there we rolled about 90km down hill, on a grand cement surface, to the border with the Cochabamba province. This was where the aspect of shake was dominant in the form of landslides, that oftentimes blocked half the road. Then followed our beloved ripio (gravel) road, which was actually on the better side of bad! Ascending a hill out of one of the friendly villages, a local one-legged 18-year old zoomed past us on his bike with a triumphant smile plastered all over his face. 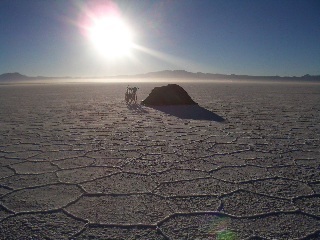 Unfortunately he wasn’t at all interested in lugging our load up to the next pass. Smart lad! 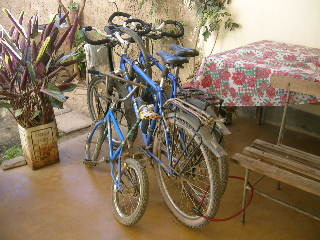 We returned from lunch in a restaurant, only to discover that our bikes had reproduced in our absence! 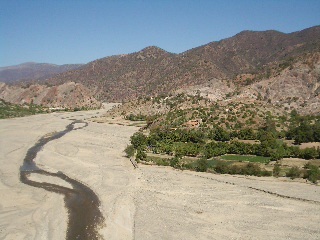 From the once lovely colonial village of Aiquile, destroyed by an earthquake in 1998, it was rattle all the way. Cobblestones took over with a vengeance and we got to ride the narrowest bike lane in the world! 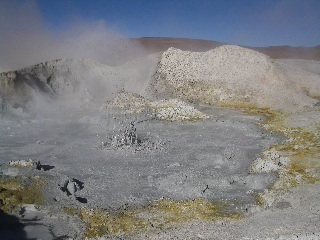 This being the 8cm cement border between the rugged surface of the stone road and the drop off to the thorn-laiden dust margin. Quite the circus act at times… but our 9 punctures in the space of 3 hours are evidence of our failure as tight-rope cyclists!!! Narrowest bike lane in the world! This was the straw that broke the camel’s back and after 2 days of cobblestones, we jumped on a bus to the start of the tarmac stretch, a good day’s roll from Cochabamba. We camped a lot en route, and even had the use of a health centre’s kitchen and bathroom, thanks to Rosmary. The weather on this stage was a whole lot more pleasant. 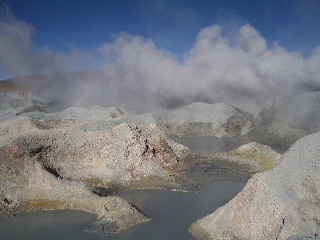 Even though it’s winter here, we have been enjoying 25 degrees Celsius during the day since we dropped from 4,000m. 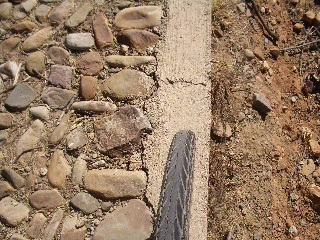 25km out of Cochabamba, Kurt noticed a crack on his rear rim. Luckily it held all the way into the city where he found a replacement that fits in both size and colour. After 16,000km, it was also time to replace Darina’s front Maxxis Overdrive tyre and front hub ball-bearings… all of which was painless with the numerous stalls and workshops in the central market area. 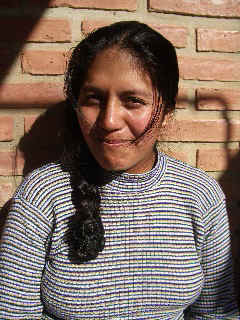 Here in Cochabamba, Darina took some time out to busy herself on the toilet and is singing the praises of an en suite bathroom to save crucial Kms. Meanwhile, Kurt got his visa extension (Swiss get 30 days, as opposed to 90 days for EU members): a process which involved queueing at 4 different counters for 2 days, half-a-forest worth of paperwork and a whole lot of anger management *%$X&/*!!!! 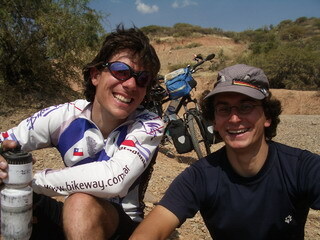 Felix (German) and Alain (Swiss) from Salta days, have caught up with us again and we’re all headed towards La Paz on the weekend. It’s been a month of few, but strenuous Kms, and a lot of cultural exploration and chill-out time, to blend in with the relaxed local pace!